A true rugby superstar - Dan Carter is arguably the world's best fly-half and his reputation and subsequent fame transcends both hemispheres. He possesses a complete package, including great speed, defensive strength and a dangerous side-step. A reliable goal-kicker and astute tactician, the accomplished Carter is the All Blacks' leading all-time Test points-scorer having eclipsed the mark of Andrew Mehrtens. After making his Super Rugby debut for the Crusaders in 2003, he became an All Black that same year, displaying huge talent at the tender age of 21. The Canterbury-native made an impressive international debut at inside centre against Wales on June 21, scoring a try, six conversions and a penalty in New Zealand's crushing 55-3 win in Hamilton. Carter was then included in New Zealand's 2003 Rugby World Cup squad where he first came to the attention of the wider international rugby audience - despite being a bit-part player in the latter stages of the All Blacks' campaign that ended with a semi-final defeat to Australia. He bounced back from that disappointment the following year with a series of strong performances and he finally made the switch to fly-half at the end of the year, displacing Carlos Spencer. The following year brought the challenge of the British & Irish Lions and it was one that Carter rose to. He notched 11 points in the 21-3 1st Test victory but it was his performance in the series-clinching 2nd Test triumph in Wellington that catapulted him to a new level of excellence. He scored two tries, five penalties, and four conversions to end the match with 33 points, smashing the previous All Blacks record of 18 points in a Lions Test. His total of 44 points in two Tests against the 2005 Lions left his just two points shy of the most points scored by any player in all Tests against the Lions and injury ruled him out of the final Test. 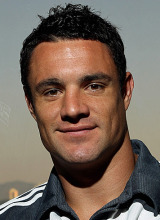 After a standout year, that also included victory in the Tri Nations, Carter was named 2005 IRB Player of the Year, and New Zealand's Player of the Year. The following year brought further reward for Carter and New Zealand with a third successive Tri Nations crown and the All Blacks entered the Rugby World Cup as favourites. But Carter had to share in the blame for the All Blacks' worst ever World Cup showing after they crashed out in the quarter-finals at the hands of hosts France. The All Blacks bounced back to form with Carter at the heart of another Tri-Nations success in 2008 that was followed by another Grand Slam end of year tour. Carter's provincial career is equally impressive during a dominant era for the Crusaders. The accomplished Carter reached the final of the competition with the Crusaders in 2003, 2004, 2005, 2006 and 2008. Although they lost the 2003 and 2004 finals, by 2005 he had moved to fly-half and inspired a prolific run for the Canterbury-based franchise that included three titles in four years. In the 2006 season Carter scored the most individual points for a player in one season with 221. In April 2008 it was reported that Carter was considering a lucrative move to the northern hemisphere, a move that would add to a worrying player drain from New Zealand. Fearing the loss of another of their stars, Carter was granted a sabbatical by the New Zealand Rugby Union as part of a new contract. In the face of a host of reported offers, Carter subsequently signed a seven-month contract with French Top 14 side Perpignan, worth a reported £500,000, and joined the team after the All Blacks' end of year Grand Slam tour. But his sojourn was brought to a premature end after just five games due to the recurrence of an Achilles tendon injury in February. He was forced to watch from the sidelines as his side went on to claim the Top 14 crown. After briefly contemplating offers from elsewhere in New Zealand, Carter re-signed with Canterbury and the Crusaders. In 2010, Carter achieved another career milestone when he passed the 1,000 points marker in Super Rugby and later eclipsed Australian Stirling Mortlock as the all-time leading points scorer in Super Rugby history. After guiding the All Blacks to their 10th Tri-Nations title with a win over South Africa in Soweto, Carter announced that he would undergo ankle surgery, resulting in an eight-week lay-off. But he returned to action for the end of year tour and helped propel the All Blacks to a Grand Slam tour of the UK & Ireland. In the process he also became the all-time leading scorer in Test rugby with his 12-point haul in the final game against Wales carrying him past the mark of England's Jonny Wilkinson. With the 2011 Rugby World Cup approaching, speculation over Carter's playing future re-surfaced but in a major boost for New Zealand rugby he shunned several overseas offers to re-sign with the NZRU in a four-year deal that includes the option of another sabbatical. Carter hoped to celebrate his new deal by inspiring the All Blacks to World Cup glory. However, his hopes of doing so were dashed by a groin injury he suffered in training on the eve of his side's final pool game, against Canada. But he pulled on the black shirt once again for the 2012 Rugby Championship and helped guide the All Blacks to a clean-sweep of the competition. He was later honoured as the 2012 IRB Player of the Year and joined Richie McCaw as a multi-award winner. Dan Carter has been tricked into signing more than "a couple" of copies of his autobiography.